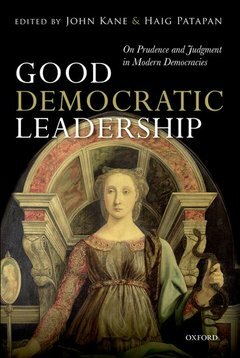 Good Democratic Leadership: On Prudence and Judgment in Modern Democracies explores whether, in the current atmosphere of international economic and political tension, and more generally, democracies foster and support effective political judgment and good leadership. In one sense, with their ideals of transparent government and extensive deliberation, democracies might appear to promote such good leadership and sound decision-making. Yet, in another sense, democratic leaders continue to face a number of challenges, including the sometimes cumbersome institutional limits placed on their discretion, the need for balance between national interest, popular sentiment and universal values as well as the problem of disproportionate influence of commercial interests in the management of the economy. In analysing various aspects of democratic leadership, judgement and decision-making from a variety of theoretical and practical perspectives, all the contributors to this book address this question of the extent to which democracies support good judgment and thereby the possibility of good leadership in democracies. John Kane attained his PhD at the London School of Economics and is now Professor in the School of Government and International Relations, Griffith University, Australia. He teaches in political theory, political leadership and US foreign policy and is a researcher in Griffith's Centre for Governance and Public Policy. He has published many books and articles internationally, been awarded numerous research grants, and been Visiting Professor to Yale University on three occasions. Haig Patapan's research interests are in democratic theory and practice, political philosophy, political leadership and comparative constitutionalism. He is Director, Centre for Governance and Public Policy and a Professor in the School of Government and International Relations, Griffith University, Australia.